Home Boxing Crawford: "I would love to fight Pacquiao, but it is a business"
Crawford: "I would love to fight Pacquiao, but it is a business"
Terence Crawford showed interest on fighting the Legend Manny Pacquiao. Crawford previously defeated John Molina Jr. last Saturday, December 10, 2016, via eight round technical knockout. After that fight, Crawford said ""I showed everything in this fight," "Give credit to John Molina because he came to fight." "I would love to fight Pacquiao, but it is a business. Right now I want to fight anyone with a title. I want their belts. 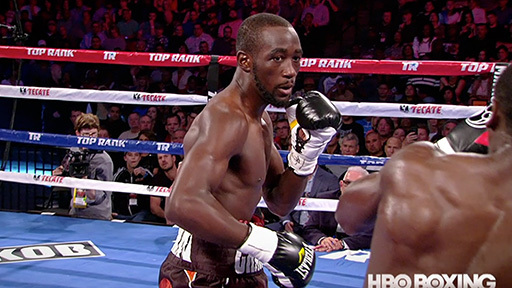 Crawford is the no.1 in the super lightweight division. A two division world champion since 2014. Meanwhile, Pacquiao recently said that he also wants to fight Crawford. Pacquiao willing to go back to the super lightweight division where Crawford is the current WBO and WBC Champion.